The “D” in DVI-D represents digital meaning that it can only be used to connect to a purely digital monitor. Now look at the DVI-I cable on the right, you will notice there are 4 extra little pins on this one. The “I” in DVI-I stands for Integrated meaning that it integrates both digital to digital as well as analog to analog connections. Note the picture here showing the difference of the DUAL link vs SINGLE link DVI cables. The DUAL link connection has a solid block of pins and the single link has a space in the center. The technical difference is as follows. Should I use a DVI Dual Link or Single Link Cable? For Dual link to be utilized, the video card, the cables and the monitors must all 3 support DVI Dual Link throughput. As of 2012 most monitors have standardized on 1920×1080 HD so the benefit of using a dual link DVI cable from the standpoint of increased resolution, is a mute point. However, since Dual link is backwards compatible with single link, it cannot hurt to use a DVI-D Dual link cable when possible. 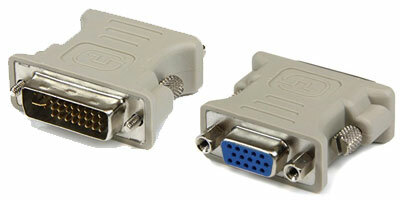 To connect a digital source to an analog display, or vice versa you will need a DVI-D to VGA adapter (shown left). This DVI to VGA adapter will convert to the lowest common denominator, which in this case would be analog. For example, let’s say you have a high end video card which has digital outputs by default, but you have older analog (VGA) monitors that you want to connect it to. You would use an adapter like this to convert from the video cards from digital to analog. One side of this adapter will connect to the digital video card, the other would connect your VGA monitor cable. QuadStation multiple monitor computer systems feature all digital connections and support from 2-12 independent displays. We can build just the computer or provide monitors and mounts for a complete turnkey system. Shipping is FREE anywhere in the continental USA. The best computer you will ever own. See all systems here.